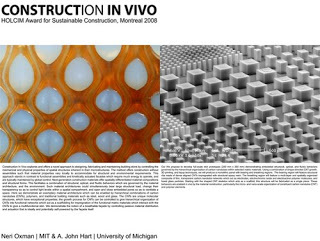 Neri Oxman (MIT) and A. John Hart (University of Michigan) received the first prize in the Next Generation category of the HolcimAwards for Sustainable Construction, 2008. The Holcim Awards ceremony for North America was held on October 16, 2008, in Montreal. 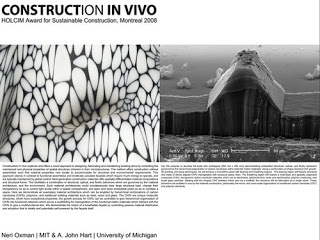 Oxman's and Hart's winning entry is entitled: "Construction In Vivo" and offers a novel approach to the design, fabrication and construction of smart building skins using Carbon Nano Tubes.